The Gems and Jewellery industry is progressing at an impressive rate around the world. But with the global exposure, the thirst to have an up-close encounter with the seldom-seen is insatiable. It demands for something which won’t let you take your eyes off… something extremely unique yet classic to stand the test of time! 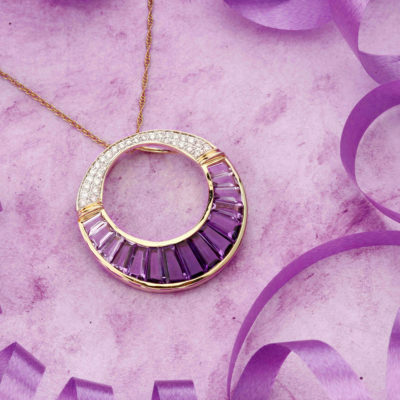 Our Amethyst Gradient Collection does just the same. Demonstrating a unique skill, the collection’s easy and soothing finished look masquerades the difficulty which goes in the manufacturing of these pieces, especially the tapering of the stones. 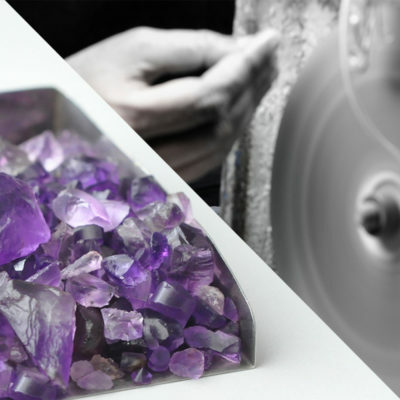 The Journey of Amethyst Gradient Collection begins from the best of the mines in Brazil, Uruguay, Sri Lanka and Siberia. 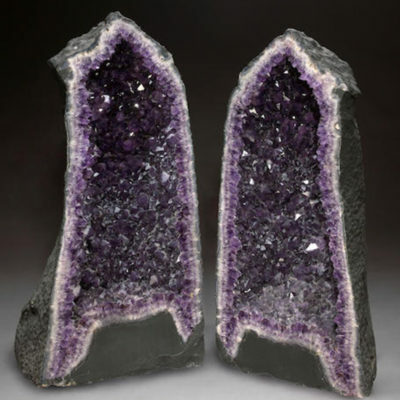 This purple variety of rough Quartz exchanges many hands and undergoes many transformations before it is hand selected by our experts. The roughs are then assorted based on their quality and color density, ready to be cut into Preforms – each stone is planned and cut based on its color banding, zoning, shape and inclusions within. 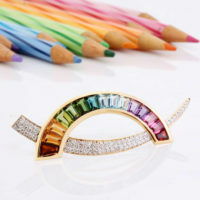 Next, based on the design the Amethyst is re-assorted and reshaped .. a skilled art- it is done freehand. The cutter holds the preform at the tip of his fingers and grinds it using a spinning wheel called “lap” primed with diamond powder. Once faceted, every stone is perfectly tapered cut to fit the design and is polished to ensure the highest standards of uniformity in size, shape, gradation and symmetry. 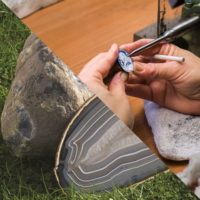 We strive to offer unparalleled high-precision finishing, minimum variance of colour difference and dimensional consistency of all our natural gemstones, to solve your jewellery and timepiece manufacturing challenges. It took us over five years of continuous practise to perfect high precision cutting of natural coloured gemstones to tapered baguettes so that it can be custom fit to any design. Endless is the road to explore, experiment and innovate as no matter what length you go to, seeing the satisfaction in your customer makes it worth the journey!